Some experts say technologies such as social media and video games are like drugs. Others disagree. This debate is really about whether technologies are addictive. But the defining property of a psychoactive drug is not “addictiveness”, but the ability to change a user’s mental and emotional state. This ability – sometimes beneficial, sometimes dangerous – has made drugs an important influence on the human story. Now some technologies have this ability too. Rather than debate whether or not technologies are addictive (some can be, for some people), I believe there is value in understanding (and exploiting) their role as mood-regulators. In this light, I reviewed drug research to understand the complex roles that “mood-regulating artefacts” can play. Many people use drugs, for reasons and with consequences that are broader and more varied than addiction. Research from anthropological and historical perspectives shows that drug use is an ancient behaviour, deeply embedded in human societies, and impacting activities as varied as work, religion and politics. Caffeine, a very widely used drug, powers the working day by reducing fatigue and increasing motivation. Alcohol has been a solace and social lubricant for millennia. Hallucinogenic drugs have been central to spirituality, as was tobacco before it was domesticated and eventually globalised. Today, new drugs affect aspects of life as varied as work and study, moral decision-making, and youth social gatherings. And of course, a broad range of prescription drugs change users’ mental states for therapeutic purposes. While drug addiction is a serious problem, only some drug use represents serious addiction. For this reason, some pharmacologists have proposed that we view psychoactive drugs as tools for manipulating mental states, allowing us to achieve goals such as adaptation to workplaces and social settings. In fact, we use drugs and technologies for mood-regulation, to shape how we feel and behave, to relate better to others, and to achieve our goals. It is clear that some people engage with some technologies to the point of compulsion and harm, with phone, Internet and poker machine abuse included among the “behavioural addictions”. There are concerns about the impact of excessive technology use upon attention span, relationships, work-life balance, and child development. It’s been suggested that consumer-tech firms deliberately design addictive products, while some users have gone as far as to seek rehabilitation. 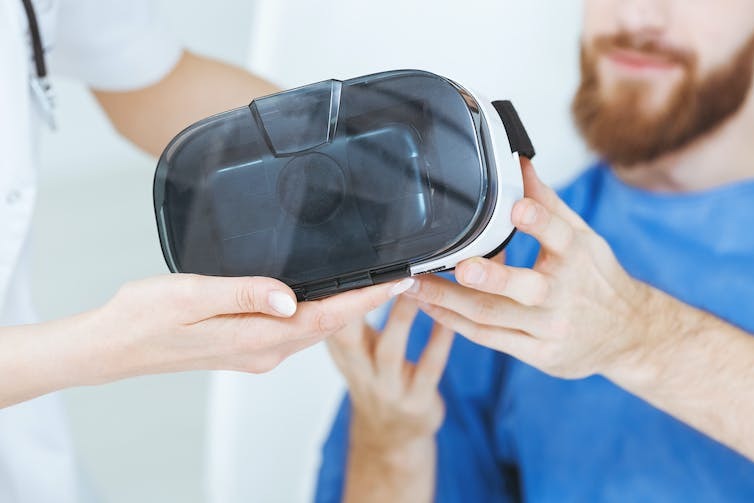 Virtual reality technology could have therapeutic uses. But it is problematic to label a technology itself as addictive, since only some users are affected to that extent. If the defining characteristic of a psychoactive drug is the ability to alter mood, does this suggest a more useful way to compare drugs with technology? It might, because many recent digital technologies can change users’ mood, including games, phones and social media, online video, and virtual reality. This is also true of “old media” such as television and recorded music, which new mobile platforms make available any time and anywhere. Researchers are investigating the use of web and virtual reality apps to change mood for therapeutic purposes. Many apps available on the the iOS and Android stores claim to help manage issues like anxiety, although users should take professional advice before using one. Other researchers are experimenting with new ways to alter mood, including smell and driverless cars. Perhaps the popularity and impact of some technologies come partly from the ability they give us to manipulate our moods. Mood regulation shapes human cultures. The ability to change one’s mental state, and to satisfy this desire in others, has inspired commerce and innovation, underpinned power relations, and compensated the downtrodden. Mood-regulating technologies might gain a similar significance, helping us adapt emotionally to a challenging and fast-changing world. But the addiction debate shows we need better ways to understand this aspect of technology use. Thinking of technologies as “tools for manipulating mental states” might help us tell a story of technology use – helpful, harmful or ambiguous – which compares in its richness to the story of drug use.